It’s been two months since I consolidated all my sites into this blog and started writing more. This blog just has a great February and I thought I’d share some stats. 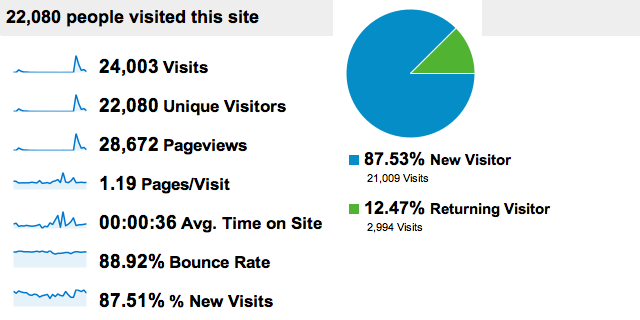 Great stats for February: 22,080 visitors to Hiltmon.com. However, very very few read an additional article over the one they were looking for. I guess they found what they were looking for and moved on. Good to see the number of repeat visitors growing, but again it seems this is more people coming back to re-read the same article, not browse for more content. Retweets do create minor spikes, but most retweets did not attribute the article to me or tag my twitter id @hiltmon. I used an article title search on Twitter to find these retweets. I only gained 10 new twitter followers this month. Facebook and Google+ added no new viewers. Most of these views came via referrals from reddit programming or Hacker News. It was so exciting to watch the simultaneous viewer counts rise using Google Analytics live beta. Also pleasing to see that Octopress and Dreamhost gave no problems and remained very responsive to viewers. But much as I like the volume, I don’t seem to be growing a brand out of these referrals. Then again, I’m still trying to figure out what my brand should be. Chrome is most popular for Reddit and Hacker News readers. Safari for others. Only 0.11% from Blackberry and 0.22% from Windows Phone. Almost 80% of Windows users are on Windows 7, but I was suprised that some are still on Windows 2000. 66% of Macintosh users are on Snow Leopard and 30% on Leopard. About 5% of my viewers were on mobile devices, 66% are using Apple products, the remainder are on Android, split between HTC and Samsung devices.